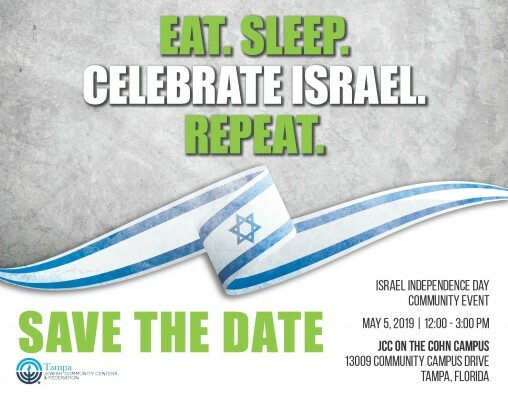 Join the Tampa community in celebrating Israel turning 71! Israel with Engineers Ari & Arielle. Story time, bounce house and crafts will enhance this exciting trip. DJ John will have the dance party going on in the Judy Cohn Plaza. 12:00 - 3:00 PM | NEW THIS YEAR! Tweens/Teens and adults can engage in two exciting Escape Rooms. Photo Booth “around Israel,” crazy balloon animals and face painting for all. Food trucks*, snack stations* and community organization booths will line the campus. The Israeli Declaration of Independence made on May 14, 1948, the day before the British Mandate was due to expire, was the announcement by David Ben-Gurion, the Executive Head of the World Zionist Organization and chairman of the Jewish Agency for Palestine, that the new Jewish state named the State of Israel had been formally established in parts of what was known as the British Mandate of Palestine and on land where, in antiquity, the Kingdoms of Israel and Judah had once been. The event is celebrated annually in Israel and across the US with a national holiday called Yom Ha'atzmaut (Independence Day). Every year, we host a community-wide celebration, attracting more than 2,500 people annually. We celebrate Israel's birthday with Israeli entertainment, food, kids' activities and more.